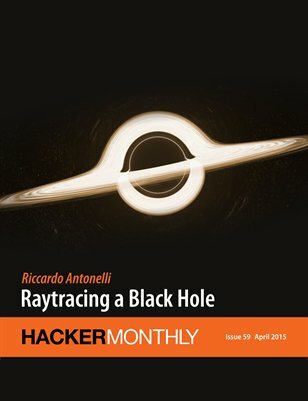 Issue #59 features "Raytracing a Black Hole" by Riccardo Antonelli on the cover. And, we have "The Poor Man’s Voxel Engine", "Using Named Pipes and Process Substitution", "Embracing SQL In Postgres", "The $3500 T-Shirt", and more. This is the first of the final twelve issues of Hacker Monthly.